We are delighted to announce that our new Online Club Shop is now open for business! Lothian Running Club in partnership with leading sports brand JOMA and FOOTBALL NATION are now able to supply a range of Lothian branded kit. The kit features our new club logo, in most cases with a small printed logo on the chest and a larger printed logo across the back of each garment, with a range of matching leggings and shorts available if required. 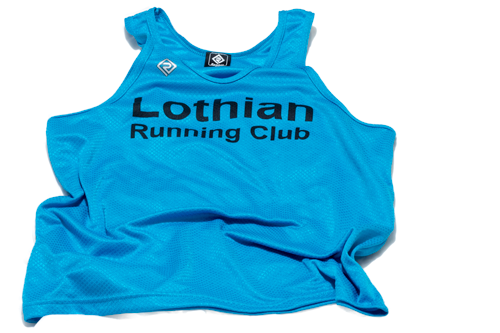 Club Vests (see below) are not currently available from the on line shop, but will be added in the future. All items come in sizes from age 8 to adults XXL and can be delivered to your home or collected from The Football Nation shop on Lothian Road, Edinburgh. Due to a stock issue, only one item, in one size is unavailable – the Adult Long sleeve t-shirt in size L.
Every possible effort will be made to ensure orders are met in time for Christmas delivery where the order is placed no later than 11 December 2018. Therefore, don’t delay and get orders submitted as soon as possible.